The Fox Hotel, built in 1925, was a relative newcomer to the Elgin hotel industry . It was preceded by such hotels as The Waverly, The Jennings (also known as The Fosgate) and the Kelley Hotel. The Fox Hotel maintained 118 rooms with 60 baths. The hotel's lobby sported solid mahogany woodwork and terrazzo mosaic floor. 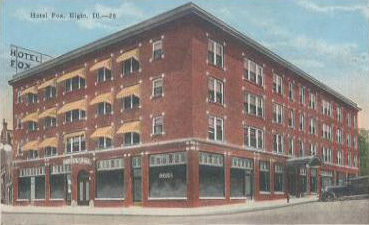 While many of the Elgin hotels fell victim to the wrecking ball, the Fox Hotel building still stands. At 156 Division, the building was renovated by The Northwest Housing Partnership in 1993, and serves as a senior citizen home.